The Rebel Sweetheart. : It's a Watch! It's a Bracelet! No, it's a Heart Rate Monitor! It's a Watch! It's a Bracelet! No, it's a Heart Rate Monitor! A few days ago, I chanced upon this quirky-looking watch while browsing through my Facebook news feed. A friend of mine posted the picture, with the caption "I want this!" At first glance I thought this was one of those old school digital Casio watches that are back in style and making waves in the fashion scene today. But upon closer inspection, I realized it wasn't a watch! It's a heart rate monitor. A Polar RCX5, to be exact. For those who have no idea what a heart rate monitor is, it's a personal monitoring device which measures an individual's heart rate in real time or record a person's heart rate for later study. It is largely used by performers of various types of physical exercise. 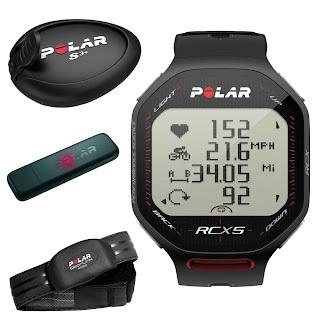 And the Polar RCX5 is one of the more popular brands of heart monitors in the market today. It's the ideal 'training computer' for runners, cyclists, triathletes, marathoners, and athletes of various sports. It's a must-have for athletes who have a passion for going further, faster, and harder than the competition. Now I'm not surprised that my friend is lusting for such a device. She's into running and marathons lately, and I'm sure this nifty little contraption will come handy for her endurance training and help her improve and optimize her skills. I hope she gets to have one in time for her next run! very nice--what great features it has! TY for sharing. I'm back running now, and could use something like this. This is exactly what I need. :) I wonder where I can get one of these? Oh, i would love to buy one like that for my hubby. another one item on my list of things to buy now. This is such a good thing to know about for getting fit! Thanks for sharing! This actually looks great and something I should own now that I go to an aerobics class every week. Monitoring my heart rate is important when running as it lets you know when you can push yourself further. I so need this desperately...! I have no idea how many calories i burn with any exercise and since I have a heart problem, I need to know where my heart rate is at any given moment. FYI: Giveaway on my blog...!Go check it out.